Excel’s Goal Seek is a single solving program that iterates one variable until another one reaches a target. SGS allows selection of a primary and secondary input variable for repetitive Goal Seek solves. 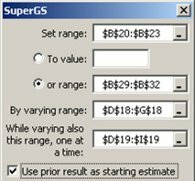 Excel’s Solver program seeks a solution to multiple non-linear equations for which an input estimate is provided. SS allows selection of a primary and secondary value for repetitive Solver operations. It also operates to find multiple optimum process conditions.